Food Patriots is the food movie for people who aren’t in to food movies. It takes a simple, non-preachy approach to the topic at hand; which is ultimately eating better, healthier food. The documentary centers on Jeff and Jennifer Spitz and their two sons, Sam and A.J. A few years ago, Sam got sick after eating contaminated chicken. What should have been an easily-treated case of food poisoning was actually an antibiotic resistant bacterial infection that caused the football player to lose an alarming 30 pounds in 4 weeks. After the health scare with their son, Jennifer knew the family had to make a change. 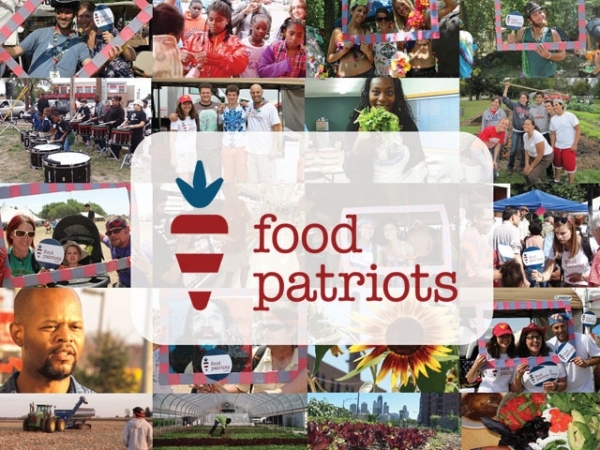 Food Patriots follows the family as they make small, meaningful changes to their eating and shopping habits, finding plenty of other Food Patriots along the way. There’s LaManda Joy who founded a community garden project in downtown Chicago reminiscent of the Victory Gardens of World War II. Then there are the athletes at the University of Wisconsin who are learning how to grocery shop, eat well, and cook for themselves now that they are away from home; and plenty more Food Patriots in between. Jennifer describes Food Patriots as “people who change the way they eat, buy and teach the next generation about food.” For the Spitz’, that meant starting their own backyard garden and building a chicken coop. They also changed to buying more local, organic and fresh produce. The idea of making small changes to make a big difference permeates throughout the film. It’s the concept of making a 10 percent change, something manageable for everyone, that drives the Food Patriots. That 10 percent can mean something different for everyone. It may be buying 10 percent more local, fresh, organic produce or 10 percent more antibiotic-free meat. Food Patriots puts a lot of emphasis on “voting with your purchases.” The Spitzes and many of the people they encounter over the course of the documentary believe that what they buy in the grocery store is their way of telling the food companies what kind of products they want. If fewer people buy processed food, over time, less of it will be available. All the talk about small changes individuals can make is impressively empowering. The people the Spitz family encounter aren’t bigwigs, they’re everyday people who had an idea and ended up making a big difference. Making change 10 percent at a time is good enough, and more importantly, is something everyone can do. For more information, or to join the movement, visit foodpatriots.com.